Ryan O’Donnell, Nicholas Lewis, Steve McIntyre (Climate Audit), and Jeff Condon (The Air Vent) have finally succeeded in running the gauntlet of reviewers (one hostile Hockey Team reviewer, actually) to publish their paper in the Journal of Climate refuting the results of Steig, et al., who had claimed statistically significant warming in West Antarctica in their 2009 Nature paper. Steve and Jeff had previously refuted Steig’s results in their blogs (links above), but publishing in a peer-reviewed journal will overcome the usual objections. Assessments of Antarctic temperature change have emphasized the contrast between strong warming of the Antarctic Peninsula and slight cooling of the Antarctic continental interior in recent decades… Here we show that significant warming extends well beyond the Antarctic Peninsula to cover most of West Antarctica, an area of warming much larger than previously reported. West Antarctic warming exceeds 0.1 deg C per decade over the past 50 years, and is strongest in winter and spring. What planet is this AP journo living on? “The European Space Agency is launching a satellite that scientists hope will help them pin down the effects of global warming on the Earth’s ice packs more precisely. For coastal cities and islands, the information may be a question of survival. If all of the Earth’s polar ice and glaciers were to melt, sea levels could rise up to 230 feet (70 meters), Miller said. “Low-level clouds cover more than a quarter of the Earth and exert a strong cooling effect at the surface. … Cloud tops have a high albedo and exert their cooling effect by scattering back into the cosmos much of the sunlight that could otherwise warm the surface. The cosmic-ray and cloud-forcing hypothesis therefore predicts that temperature changes in Antarctica should be opposite in sign to changes in temperature in the rest of the world. 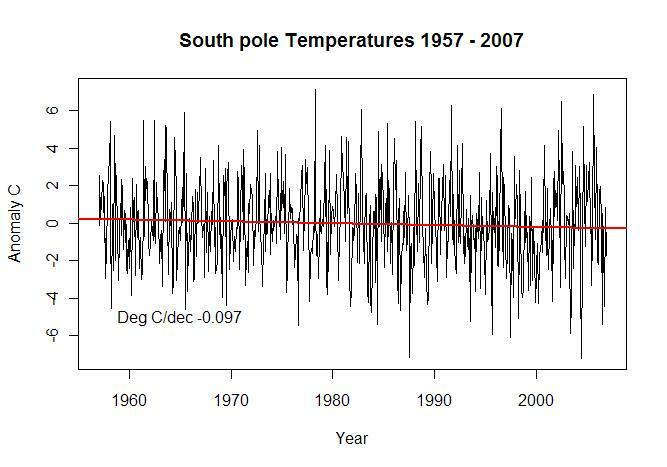 This is exactly what is observed, in a well-known phenomenon that some geophysicists have called the polar see-saw, but for which “the Antarctic climate anomaly” seems a better name (Svensmark 2007). To account for evidence spanning many thousands of years from drilling sites in Antarctica and Greenland, which show many episodes of climate change going in opposite directions, ad hoc hypotheses on offer involve major reorganization of ocean currents. While they might be possible explanations for low-resolution climate records, with error-bars of centuries, they cannot begin to explain the rapid operation of the Antarctic climate anomaly from decade to decade as seen in the 20th century (figure 6). The ice shelves are attached to the continent and already floating, holding in place the Antarctic ice sheet that covers about 98 percent of the Antarctic continent. As the ice shelves break off, it is easier for outlet glaciers and ice streams from the ice sheet to flow into the sea. The transition of that ice from land to the ocean is what raises sea level. Based on a new analysis of passive microwave satellite data, we demonstrate that the annual mean extent of Antarctic sea ice has increased at a statistically significant rate of 0.97% dec-1 since the late 1970s. This rate of increase is nearly twice as great as the value given in the [UN IPCC’s] AR4 (from its non-peer-reviewed source). So, the peer reviewed literature, both extant at the time of the AR4 as well as published since the release of the AR4, shows that there has been a significant increase in the extent of sea ice around Antarctica since the time of the first satellite observations observed in the late 1970s. And yet the AR4 somehow “assessed” the evidence and determined not only that the increase was only half the rate established in the peer-reviewed literature, but also that it was statistically insignificant as well. And thus, the increase in sea ice in the Antarctic was downplayed in preference to highlighting the observed decline in sea ice in the Arctic. John King of the British Antarctic Survey, based in Cambridge, warned against misinterpreting the lack of summer warming. “A HUGE hole in the ozone layer has protected Antarctica from the impacts of global warming, according to scientists. The temperature across Antarctica has not risen over the past 30 years [it has cooled] and there has been a 10 per cent increase in the amount of sea ice appearing during winter. Climate change sceptics regularly cite the lack of warming in Antarctica as evidence global warming is not happening. However, researchers have now explained the phenomenon – they believe that a hole in the ozone layer above the continent has altered weather patterns and temperatures. The Scientific Committee on Antarctic Research [SCARE] carried out the first comprehensive review of the state of Antarctica’s climate. Their report, Antarctic Climate Change and the Environment, is published today. Only one problem — the anthropogenic antarctic ozone hole theory is toast and solar-magnetic-field-modulated cosmic rays may be responsible (here and here).